This event focuses on how to respond to forest disturbances in Europe and aims at providing a better understanding of forest disturbances and the role climate change plays in their increase. 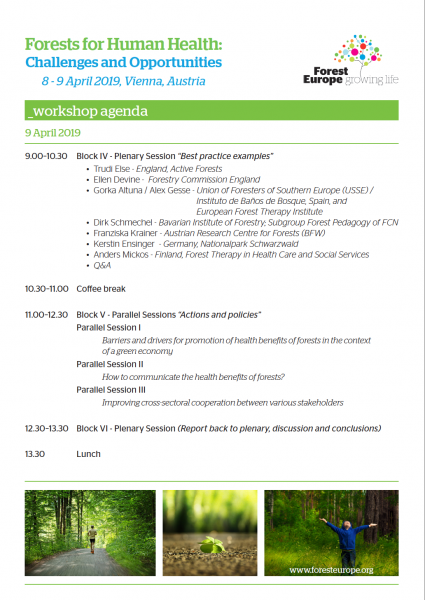 The event is facilitated by European Forest Institute and FOREST EUROPE. Workshop "Forests for Human Health – Challenges and Opportunities"
The Purpose of the workshop is to enable sharing of state-of-the-art knowledge, experience, lessons learnt and good practice examples relating to social aspects of Sustainable Forest Management (SFM) with a special attention to human health and well-being, as well as to promote health effects of forests and their integration into SFM and in this way to raise awareness about benefits that forests deliver for human health. 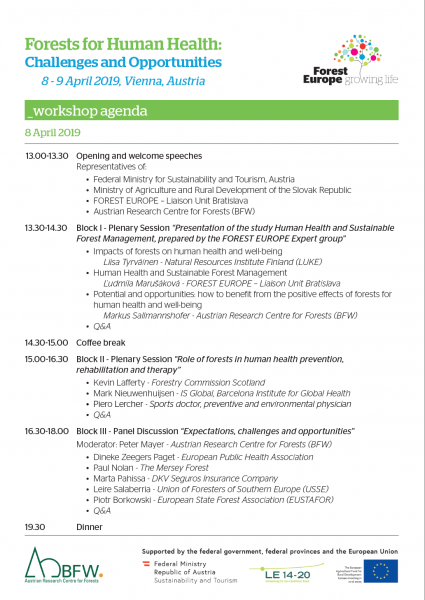 During the workshop we intend to discuss main barriers and drivers for promotion of health effects of forests with the aim to generate green jobs and build better cross-sectorial cooperation with representatives of various sectors and stakeholders. As the conclusions, FOREST EUROPE will formulate set of recommendations for policy makers and further steps for future cooperation based on discussion held at the workshop.